Everyone dreams of being a wizard or a witch. Casting spells, mixing up potions, and, yes, flying around on their broom all day. Of course, wizards and witches need to work too! After all, they can’t just sit around all day casting spells for no reason. They need to put their magical skills to good use and some of them have taken to using their daring broom skills to use by becoming speedy couriers for their witchy friends. Now, you too can take on the role of a wizardly courier with this Ravensburger game! 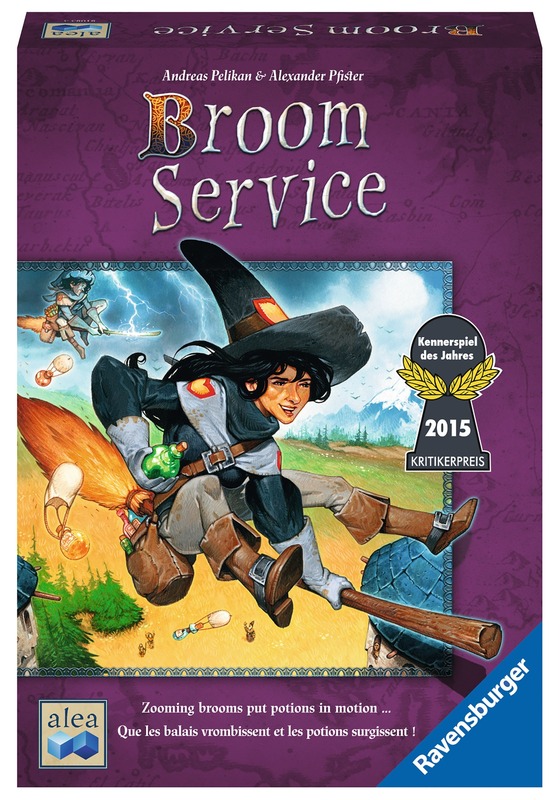 This Broom Service Board Game puts you in the role of a spry young wizard! Your goal is to brew up potions and then hop on your broom to deliver potions as quickly as possible, racking up victory points along the way. The more potions you deliver, the more points you’ll get. But watch out! If the weather acts up it might slow you down, so you’d better have a spell handy to help you keep your pace! This game comes with a game board, pawns, markers pieces, cards, amulets, magic wand tokens, game summaries, and landscape tiles. It also comes with an instruction booklet to help you learn how to play. It plays 2 to 5 players and is designed for players age 10 and older.